My name is Esam Hamzeh and I am the author of this site. I have been an artist for the past 7 years. I mainly paint natural landscapes and architecture, although I have painted some still life and others. When painting, I currently use oils, although I have also used watercolours for many paintings and experimented with others types. I am a big fan of nature and love to visit parks, in all seasons, to look at the beauty of nature and for inspiration for my paintings. My favourite is Richmond Park, because of the size of the park and relative serenity you get when visiting. 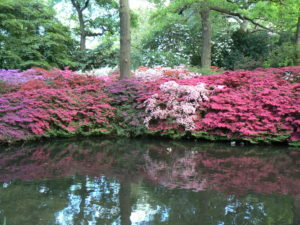 I often visit Isabella plantation, especially during Spring. In May, all of the flowers bloom at the same time, creating big and beautiful displays of colours, and I have made paintings of some of them. 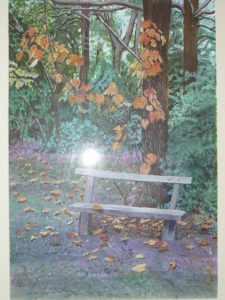 A watercolour painting of a park bench in Isabella Plantation. Photo by my son. Sorry about the flash glare! The Still Pond at Isabella Plantation. Taken in early May. Photo by my son. 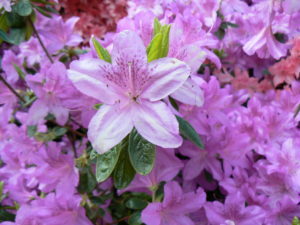 Close-up of a flower at Isabella Plantation. Taken in early May. Photo by my son. 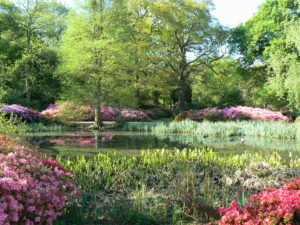 The Thompson’s Pond at Isabella Plantation. Taken in early May. Photo by my son.